Aging is one heart disease risk factor we can't do anything about. But researchers predicted that between now and 2042, a nationwide 10% reduction in body mass index (a measure of body fat based on height and weight), shown by blue bars, would offset 80% of the projected rise in heart disease due to age (pink bars). 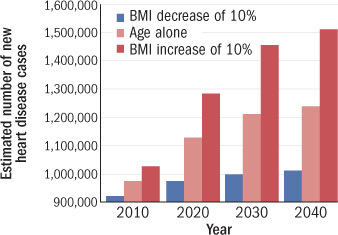 The flip side is even weightier: a 10% population-wide increase in body mass index (red bars) would more than double the increase in heart disease cases expected due to age alone (American Journal of Medicine, September 2011).